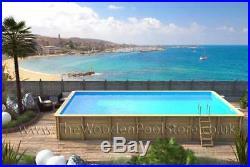 Odyssea Rectangle 8m x 4m Wooden Pool. The Wooden Pool Store is a division of HeatPumps4Pools and are pleased to announce the arrival of our new and exciting comprehensive range of wooden pools. Our range of Odyssea pools offer a beautiful looking pool which. Are fitted out with high-end state-of the art technical equipment. 2 Halogen underwater lights, 2 ladders, skimmer and return fittings matching the pool liner, solar cover, sand filter & sand, dechlorinator and the choice of 3 colours liners with co-ordinating coping. The intelligent, elegant design of the ODYSSEA POOL guarantees seamless aesthetic integration into your garden. The structure, made of carefully selected solid wood, is compatible with in-ground, partially in-ground or above-ground installation. In the case on an in-ground or partially in-ground configuration, the wooden plant housing (available as an option) must be installed to allow access to the filtration equipment. For inground use we can supply wood protection membrane, to protect the wood from damage. Rect 530 - 8 x 4m - (146cm deep). Outer dimensions (cm) 853 x 453. Inner dimensions (cm) 800 x 400. Height, coping included (cm) 146. Water volume (m³) 42.56. Water surface area (m²) 32.00. This range has the choice of 3 different coloured liners with co-ordinating copings to choose from to give you that personalisation and desired look in your garden. Havana Coping with Dark Blue Liner. Havana Coping with Beige Liner. Costal Grey Coping with Light Grey. 2 composite wood coping colours: havana and coastal grey, three 0.75 mm liner colours: dark blue, beige or light grey. 2 Halogen underwater lights, 50W, 1 electrical panel. P-FS Sand filter including the filter sand 75kg (Flow rate of 9.80m3/h). In-pool stainless steel ladder (internal 3 treads). Wooden access ladder (external 5 treads). 2 Skimmer, and 2 return fitting with 1 vacuum point. (All pool fittings match the colour of the liner). 0.75mm Liner in a choice of 3 colours with co-ordinating coping (as shown above). 280 micron bubble solar cover. Wood thickness 35mm and width 285mm. The structure is made of class IV treated Northern 45mm pine. Dechlorinator - Ecological, it dechlorinates backwash water to avoid bleaching grass etc. Coping - in 2 colours. Fittings matching the Liner colour. Underlay to help protect the liner. Heating Options Available for this Pool and Filtration Pump. Heat Pumps which are the most economical way to Heat your pool. Eraspa 14Kw THP-14NP Heat Pump. 13Kw Duratech Dura 13 Heat Pump. 14Kw Duratech Dura+14 Heat Pump. However, you get 1 Kw of output for every 1 Kw of input in power. So more expensive to run than the Heat pump option. 15Kw Elecro Evo Electric Pool Heater. (Must be kept Indoors or in Plant Housing). The Odyssea pools are also available in the following Octagonal sizes. Octo 530 - 5.25m - (133cm deep). Height, coping included (cm) 133. Water volume (m³) 18.77. Water surface area (m²) 15.64. Octo+640 - 6.43m - (133cm deep). Outer dimensions (cm) 643 x 403. Inner dimensions (cm) 590 x 350. Water volume (m³) 22.40. Water surface area (m²) 18.51. Octo+640 - 6.43m - (146cm deep). Water volume (m³) 24.62. Octo+840 - 8.42m - (133cm deep). Outer dimensions (cm) 842 x 488. Inner dimensions (cm) 789 x 435. Water volume (m³) 37.53. Water surface area (m²) 31.08. Octo+840 - 8.42m - (146cm deep). Water volume (m³) 41.25. The Odyssea pools are also available in rectangular shape. Rect - 6 x 3m - (133cm deep). Outer dimensions (cm) 653 x 353. Inner dimensions (cm) 600 x 300. Water volume (m³) 21.78. Water surface area (m²) 18.00. Rect - 8 x 4m - (146cm deep). The pool can be assembled by most competent DIY installers, or the customer can choose to use a local carpenter or handy-man to assemble the pool. A qualified electrician should be used to run the power supply to the pool and to make the necessary connections. The pool can be laid on flat, level grass which has been cleared of all stones and sharp objects which could damage the liner. Alternatively, a flat, level concrete slab can be laid to take the weight of the pool and to avoid it moving or sinking once filled with water. Underlay is supplied with the pool which is laid under the liner to help protect it from damage. Please see the user manual for details of how to install the pool. Please ensure that you have sufficient time, labour, tools and the skill required to assemble the pool before purchasing. 10 years on the structure, pool fittings, underlay & coping. 5 years on the filter. 2 years on the ladder, liner & pump. (excludes Scotland and some UK postcodes). HeatPumps4Pools are the leading UK based specialist supplier of heat pumps and related pool products. Operating from near Billericay in Essex in the UK, we are the leading specialist supplier of swimming pool heat pumps to the UK and Europe. We have a wide range of the best swimming pool heat pumps to suit any pool size and type. We are always happy to offer free friendly advice on the best heating solution for your pool. The item "Odyssea Rectangle 8m x 4m Above Ground Wooden Swimming Pool 146cm" is in sale since Friday, March 2, 2018. This item is in the category "Garden & Patio\Swimming Pools & Hot Tubs\Swimming Pools\Above-Ground Pools". The seller is "heatpumps4pools" and is located in Essex. This item can be shipped to United Kingdom.